Empathy is an incredibly valuable, woefully rare human trait, but while it’s a boon to a functional and harmonious society, empathy can be a real drag on a story. 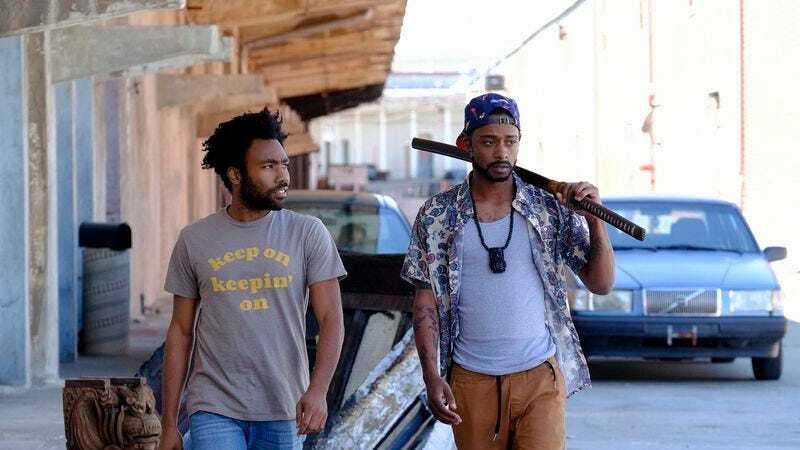 Atlanta has a deep sense of empathy for all its characters, even the fleeting characters that would be relegated to a minimal, functional role on many other shows. The best example of this so far remains the holding cell scenes in “Streets On Lock,” which breathed life into random prisoners just as well as Orange Is The New Black does. That empathy gives rise to the same narrative bind that Orange often finds itself in. When all of the characters in a story are afforded the same consideration, the story becomes harder to nail down. There’s no real hierarchy to the characters, and while it’s to the show’s credit that it doesn’t prescribe how the audience should feel about what’s happening and to whom, the result is a formlessness that feels slightly uneasy. That’s why Atlanta has become a show that works best in hindsight, and one that almost requires that each episode be viewed multiple times. Once you have a better idea of what the episode is doing, it’s easier to relax and let it wash over you. This has to be a tricky show to structure because it has four main characters including Van, who gets minimal screen time and has yet to meet Alfred and Darius. So it’s not as if Donald Glover and his team can plan out episodes simply by pairing off random members of an ensemble and seeing what happens. But “The Streisand Effect” does something close to that by giving Earn and Darius an opportunity to bond outside of their relationship with Alfred. It’s always awkward the first time hanging out one-on-one with someone you know through a mutual acquaintance. Earn and Darius’ circuitous journey to land Earn some quick cash is no exception to the rule. But before I get to that, let’s talk about the episode’s less traditional sitcom story, which is Alfred’s unwise beef with an ambitious troll named Zan. It all starts with a random interaction with what appears to be a fan, not unlike the interaction Alfred had with the police officer in “Streets On Lock.” Zan, who schleps around branded merch like Tom Haverford, is fawning in person. But as soon as he gets behind the safety of his computer, Zan unleashes a torrent of insults, memes, and Vine loops mocking Paper Boi and his music. Like anyone who has ever waded into a comment section, Alfred gets baited into a flame war even though he knows better and probably won’t be satisfied by any outcome. As usual, Earn tries to be the voice of reason, but Alfred ignores him and starts clapping back with a double-thumbed fury only matched by his peers in the upper echelon of texting. Alfred’s failure to heed Earn’s warning is what leads to the episode’s cheeky title, a reference to Barbra Streisand’s failed attempt to draw attention away from her beachfront home in Malibu, which actually drew more attention to it. It’s a classic “Don’t feed the trolls” situation, but it’s much more fraught than that for Alfred. A common line of attack on Twitter and hip hop blogs is to accuse a rapper whose image is based on a prior or current criminal lifestyle of fronting for the cameras. (An example is the venomous feud between Rick Ross and 50 Cent from a few years ago, during which Ross was outed for having once worked as a Florida correctional officer.) But Zan’s argument isn’t just that Paper Boi is inauthentic, it’s that he’s inauthentic and untalented. According to Zan, even if Paper Boi does push as much weight as he claims to, he’s still no good at rapping about it. Alfred knows its unwise to do so, but he is tempted to prove just how authentic and talented he really is, even if it means drawing more unwanted attention. Instead, Alfred takes a slightly less idiotic route, showing up randomly at Zan’s pizza delivery job to convince him to lay off. Just as Atlanta is on the cusp of creating an antagonist that isn’t poverty, torpor, or ennui, it casts its empathic eye towards Zan. The pizza delivery scenes are probably the best in the episode. Brian Tyree Henry is giving a masterful performance, and there’s something so manic and delightful about Freddie Kuguru’s performance as Zan that I hope he’ll pop back up from time to time. But when he returns, it won’t be as the villain that would lend Atlanta a plottier feel. Zan will be the guy Alfred took quasi-pity on, the one he realized has no real personal animus and is simply hustling like everybody else. Once Alfred realizes Zan is just a social media try-hard, he’s much less interested in swatting the gadfly. There’s arguably a pinch of mutual respect in Alfred and Zan’s interactions, even as Alfred is rightly horrified by Zan’s obsessive documentation and child exploitation. If Atlanta has a moral, it’s that everybody is out here hustling the best way they know how, and judgment is usually misplaced. That’s part of the reason Earn is so willing to forgive Darius for turning a simple trip to the pawn shop into a weird walkabout that ends at a dog breeder’s farm. It also helps that Darius gives Earn a phone to trade in for all his trouble, but mostly Earn just understands that Darius is out here trying to get his. By the grace of God go us all. Hiro Murai continues to slay with some nifty aerial and Steadicam shots. The first shot of Earn staring at the gun is arresting. The bar owner did some pretty ominous foreshadowing with the mention of the Dodge Challenger driving stranger who stopped by looking for Alfred. The crying Chinese bro is credited as Crying Chinese Bro. This show is making some really interesting choices with its closing credit spots, which this week went to Michael Kiwanuka’s “Home Again.” Coupled with the surprising choice of Bill Withers’ “Grandma’s Hands” from a couple episodes ago and it’s clear the show wants to use a broader sonic palette than the themes and settings would suggest. I found the Steve McQueen stuff a little too precious, but it wasn’t distracting.